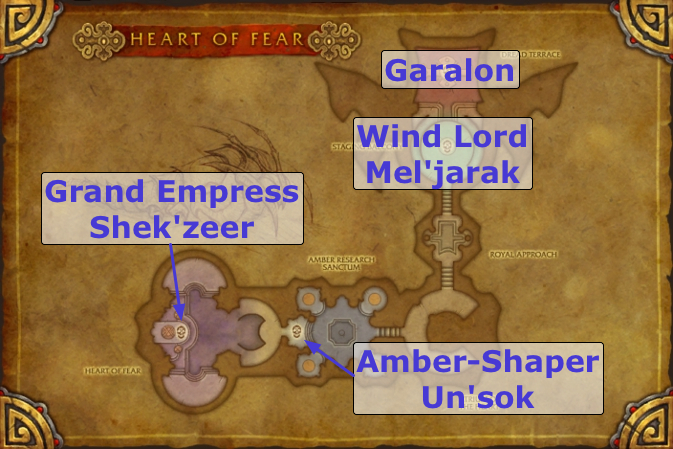 The Heart of Fear is a raid instance, introduced in the World of Warcraft: Mists of Pandaria expansion. It is part of Tier 14 in terms of PvE raid progression. This is the second raid instance available to players in Mists of Pandaria, opening on the 30th of October 2012. The raid is available in 10 and 25-man raid sizes, as well as in LFR format. All 10 and 25-man encounters have both a normal and a heroic version. Completing the Heart of Fear on normal mode is a pre-requisite for entering The Terrace of Endless Spring, another Tier 14 raid instance. The raid instance entrance is located in the west of the Dread Wastes. The raid houses 6 boss encounters. Imperial Vizier Zor'lok is the first boss encounter of the instance. This is a rather simple encounter, which will test your raid members' individual ability to deal with a number of mechanics. It requires little coordination. 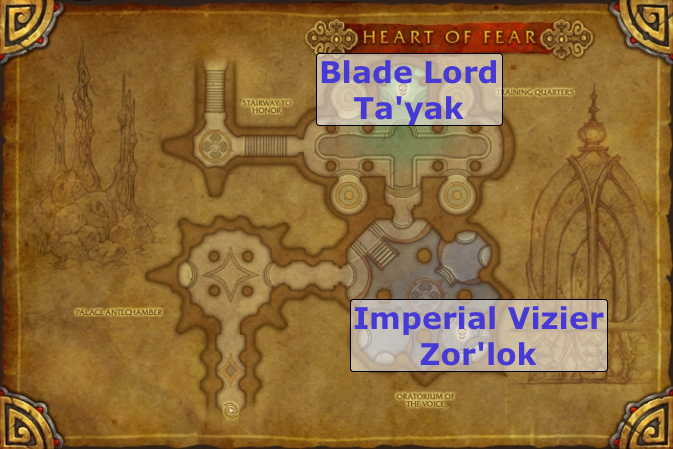 Blade Lord Ta'yak is the second boss of the instance. This is another simple encounter, which has a very unusual and innovative final phase. It will test your raid's ability to move and avoid obstacles, and it will also put your raid's DPS to the test. The third boss of the raid, Garalon, will provide raiders with an exciting, unique encounter. Many new and innovative mechanics made their way into the design of this boss, which will stress your raid's ability to execute precise tactics. Wind Lord Mel'jarak is the fourth boss of the instance. This is a complex encounter, where your raid will have to deal with many types of adds, while simultaneously tanking and killing the boss himself. Like the previous two encounters, you will notice several interesting new mechanics at play here. Amber-Shaper Un'sok is the fifth boss of the instance. This is an encounter of immense complexity and originality. It has a multitude of abilities that interact in several ways, and defeating it will require that your raid group has a very deep understanding of the mechanics. The final boss of the instance, Grand Empress Shek'zeer, is truly worthy of its place as the major boss of the raid. The encounter is a three-phase fight, where you will, yet again, have to deal with many types of adds. The fight ends with an intense final phase.